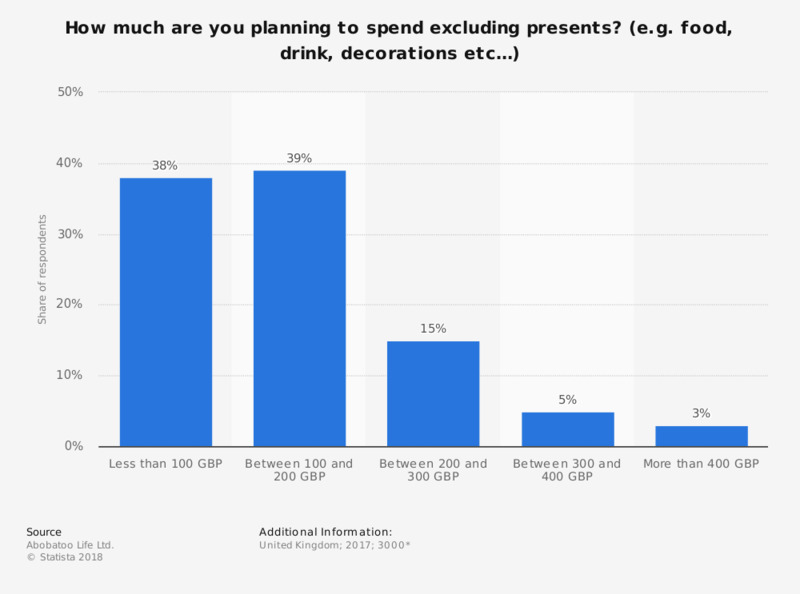 This survey was aimed at assessing the Christmas spending habits in the United Kingdom (UK) in the year 2017, posing the question "How much are you planning to spend excluding presents? (e.g. food, drink, decorations etc…)". Among surveyed shoppers, the majority planned to spend between 100 and 200 British Pounds in total, amounting to 39 percent, whereas 38 percent stated planning to spend less than 100 British Pounds. * Approximate number of participants. How confident do you feel about Christmas trading this year compared to last year? In general, how important is the decoration of each of the following rooms in your home for you? Do you agree with this statement "when I have a crush on a decorative object, I tend to crack and buy it"?